For those who relish seafood, prawns and crabs top the list. People who attempt eating seafood for the first time don’t usually go wrong if they try prawns first. I know this for a fact as many of my North Indian friends gorge on prawns whenever they visit coastal places especially Goa. 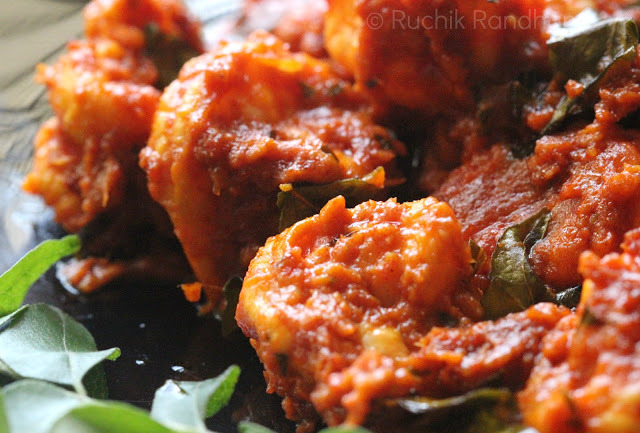 Being a fish eating Mangalorean, prawns should ideally be a part of my regular menu – but they are not. I gave up prawns (and crabs) during my school days as I developed a severe allergy which only aggravated over the years. The symptoms are many and a lot of people including hubby dear think that it’s such a pity that I don’t get to enjoy them especially when we eat out at restaurants that specialize in delicacies such as king prawn fry or tandoori crabs or lobsters even. I for one, have never regretted or missed not being able to eat the most prized catch. I can satisfy myself with the rest of what the seas have to offer. Or there’s always chicken, isn’t it? The safest bet in any restaurant almost anywhere in the world. It is just since last year that I have started popping a prawn or two in my mouth – to see if my body is ready to accept them yet. The first few attempts with crabs didn’t go down too well, but I think in a couple of years I should be able to eat prawns although I don’t relish them anymore. If not eat them, I wan’t to be able to cook them for my boys. So now you know why prawns have never featured on my blog despite the fact that I simply love seafood. It’s the man who buys, cleans, cooks and eats them alone – until the little boy was born. Now it’s the two of them giving each other the much required company in the prawn eating paradise. This is probably the only post where I cannot describe the experience of having cooked the dish myself or relished it simply because from start to finish the hubby was involved. However, I did let my other senses enjoy the experience. While touch & taste took a backseat, the aroma of the freshly fried prawns was simply wonderful and appetizing. The colour of the masala was a feast for the eyes and the sound of the prawns sizzling away signaled the taste buds to salivate. I am sure you will have a wholesome experience of enjoying these prawns to the last bite. I hope to try these sometime in the future. Till then it’s just the pictures for me! PS: ‘A prawn recipe’ got the maximum number of votes in a poll I conducted this week on my Facebook page when I asked what readers wanted to see next on the blog. Do join me there for some more interaction, chit chat & recipe requests! 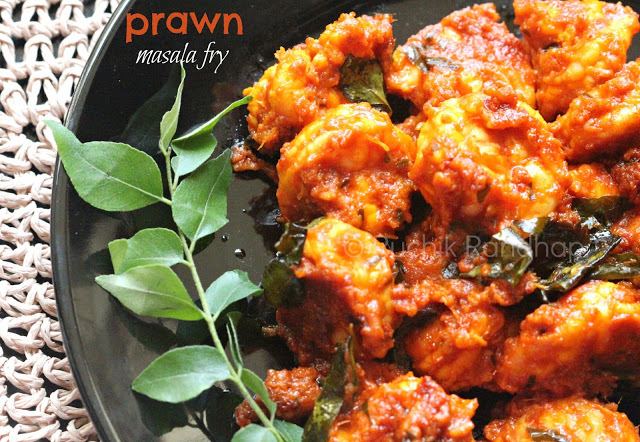 Prawns coated in a fiery masala & shallow fried to perfection! You can't go wrong with this one! Marinate the prawns with the salt, bafat powder, jeera powder, ginger-garlic paste, vinegar (or tamarind juice), rice flour, 1 tbsp oil and 1 sprig of curry leaves finely chopped. Keep aside for 10-15minutes. In a frying pan put the marinated prawns with 1 cup of water and bring it to a boil. Reduce the flame to a medium high and let the prawns cook until the masala thickens. Leave the pan uncovered. 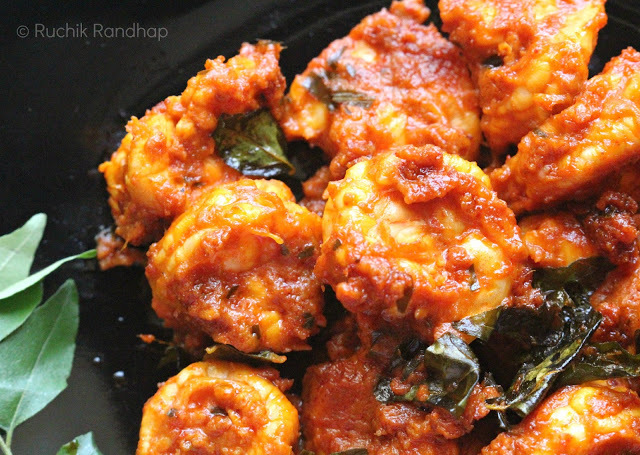 Transfer the prawns and its masala to one side of the pan and in the center of the pan pour the remaining 2 tbsp oil and the curry leaves (do not chop). Let the oil heat up a bit and then mix everything together and simmer for 2-3 minutes till the oil separates from the masala. When masala turns semi thick turn off the flame. If you don't need a thick masala continue to simmer/fry for another 2 minutes so that the masala fries some more. Above pic: Prawns sizzling away on the frying pan! That looks delicious, Shireen. It's hard to live with allergies, but you are right – there are other things you can enjoy. Its really terrible when you have food allergy like this.Btw prawn masala fry looks seriously irresistible. lovely and yummy looking for the hubby..he is drooling!!! Ahh! Prawns … My eternal favorite. Looks scrumptious . Dumb question – is bafat powder same as chicken powder – the kundapur chicken masala powder we use in kori rasa recipes? Wondering if I can cook the above recipe with that powder instead . your hubby is an awesome cook dear. thats a fantastic dish. The masala looks delicious. I think you should hand over the kitchen to him and do the blogging! Oh my i would love to finish those prawns within minutes. I could not resist it. Kudos to your hubby. This comment is for Ro. Wow! Prawns looks too good. Absolutely loved the masala. I prefer it this way rather that dry fry. Too good a combo with white rice. Nice recipe and lovely pics. Thanks a ton Chowder Singh! I wandered into your blog while looking for recipe for Sanna. My complements for maintaining a very readable and beautifully illustrated page concentrating on Christian Mangalorean food. The recipes, I find to be authentic and the style of writing simple to follw and replicate. I have tried out your Sanna and your husband's prawn Masala. Excellent! @ Rambler: Thank you very much sir for your kind words! I am so glad to hear that the Sannas and prawn masala turned out well. Thanks for your compliments on the blog and the recipes, appreciate your feedback! Shyma!! Thanks a ton for your feedback! I am so happy to know that the recipe was a success!! Happy cooking! 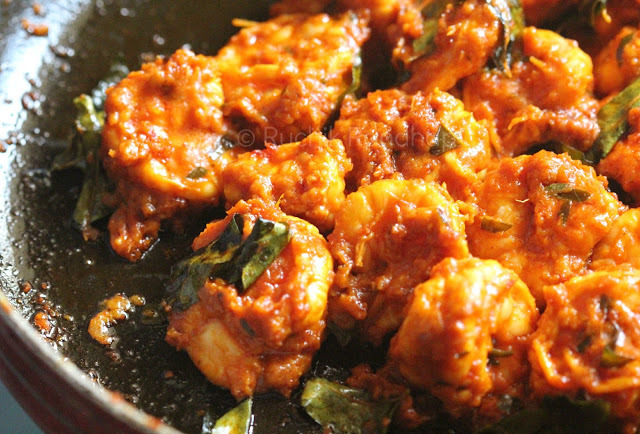 Shir, kiran is working today, and he wont be home tonight for dinner… so cooking prawn masala fry ( cooked it earlier also… its awesome)so, that i alone can finish off the prawns… yum… waiting for dinner time. guess i will finish them off before dinner and just have paez and lonche for dinner… thanks Ro & Shir for the recipe. Heheh..Ashu!! I envy you! I've not had these prawns yet..what a pity eh? U enjoy! So glad to know u liked the recipe!! I tried this today with squid…Thanks to U. fingerlickin good my kids loved it. Tried the yellow Holige too..1st time in my life,i never expected it to come so well. I tried the same receipe with squid…yummy,my kids loved it.thanks to U.5 Stars. Hoolige too came out very well.1st time.I'm surprised.. Tried it super hit @ home…tried with squid. Dear Ms.Sequeria, Prawn Masala Fry – When The Hubby Cooks recipe was too good. I cooked it for my future Mom-in-law's bday. She just liked it.. Ha ha ha here the Son-in-law cooked for the Mom-in-law.. No hubby in the pic ha haha.. Thank U for the recipe.. I am glad to say that u r website looks very attractive and pleasing to the eyes.. One recipe after another is too good..
Just a suggestion: When u are giving a recipe also let us know what main course goes well with it.. I had this dish with jeera rice. @ Austin Tellis: Thanks a ton for the great feedback! I am thrilled to hear about how you impressed your inlaws 🙂 Mighty pleased actually! I am happy to know that my website is helpful. I will keep your suggestion in mind henceforth and also give serving suggestions 🙂 Thanks a lot! 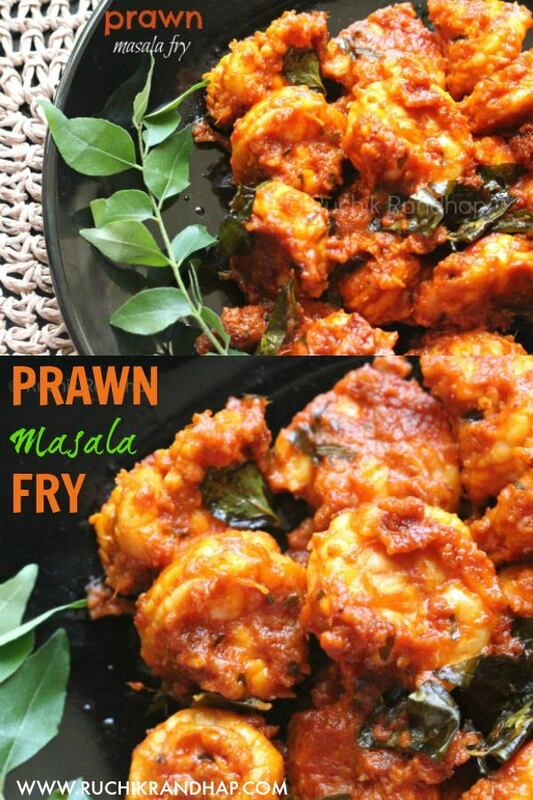 Being a manglorean sea food,…and especially prawns nd crabs are my eternal fav..i dnt cook much..bt iv never had this type of prawn ever…sooo definitely going to try this out..its souds easy,, simple..and yummmyyyyyyyyy..
Hey Shireen thank you for your wonderful recipes. Even i love to try different recipes. This dish looked very tempting. I thought of trying out with a little variation. Will let you know the results…thanks once again for the time and efforts that you put in..regards AshaGod bless you always..
Ms. Shireen, nice receipe, may I ask if its ok to replace vinegar / tamarind with lime or mango powder?. @ Sudish: It is preferable to use vinegar or tamarind or lime is ok. Not sure how mango powder will taste!